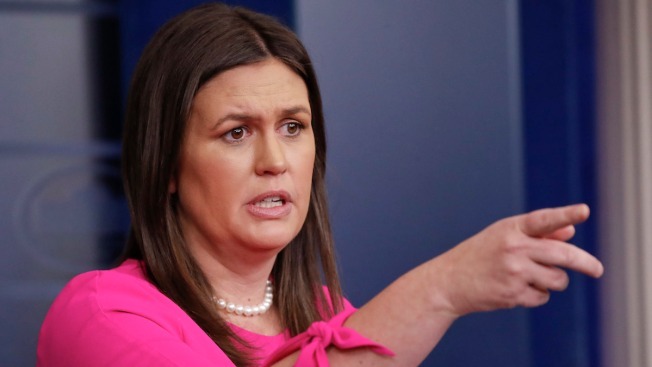 White House press secretary Sarah Huckabee Sanders gestures while speaking to the media during the daily briefing in the Brady Press Briefing Room of the White House, Monday, June 25, 2018. The website of the Red Hen restaurant in Lexington, Virginia, has been hit by a cyberattack, CNBC reports. The restaurant recently made headlines when it refused to serve White House Press Secretary Sarah Huckabee Sanders. The attackers have taken over parts of the website in order to redirect traffic to their own websites, which sell products such as discount Viagra. The attack does not appear to be political. Chris Boyd, lead malware intelligence analyst at security software company Malwarebytes, says the attackers are likely trying to take advantage of the recently heightened traffic on the website that came as a result of the controversy involving Sanders.